When the Four Horsemen launched their Kickstarter, they had six birds ready to go - the rest were left to be stretch goals. Surprisingly, the second one unlocked wasn't even a bird. Back in 2009, when the Raven won the FANtastic Exclusive vote, all of us on the FANEx message board were daydreaming about what kind of variants we could get - and since pretty much every possible bird had already been named, poster Israel Ramirez suggested Quetzalcoatl, the winged serpent. Iz-Ra-Mirrus (as the Quetzal' toy finally came to be known) has bright green feathers and blue-green feet. 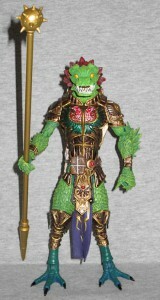 His armor is two-tone gold, with accents in green, yellow, orange and red. The head, with its large, blocky fangs, and the eyebrow ridges that flow back into curled spirals on the top of the head, ends up looking a lot like the sculptures of Quetzalcoatl that surround the Temple of the Feathered Serpent at Teotihuacan. Outstanding! 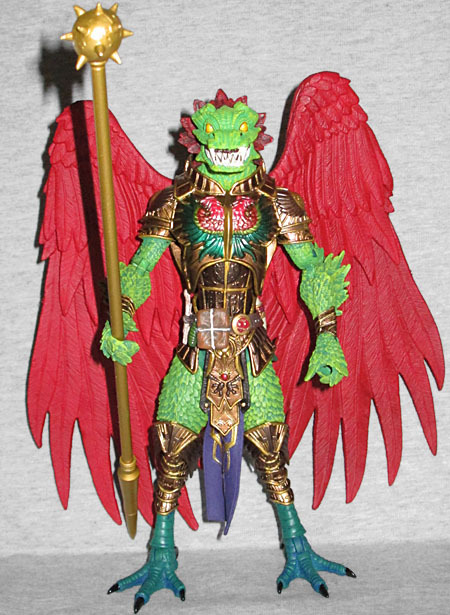 As we said, Iz-Ra-Mirrus has green feathers, so you can't buy a set of wings specifically to go with him (which is why the photo at the top of this review doesn't show him with any). However, the large feathers that stick out of the back of his head are a dark red, so the cardinal wings do look appropriate on him. Man, this is the one I wanted; humanoid reptilians are so cool. Didn't have the scratch at the time, hopefully when he's offered again it'll be a different story. Easily my favourite figure from this particular release. Looks great! Is it a quetzal or a Quetzalcoatl? Some folks say he looks better with the Black wings, which would leave the red wings for the Cardinal. And Yo, we must think alike. I suggested they make a Quetzalcoatl too. Hence the name Iz-Ra-Mirrus. @ Soundwinder, it's a Quetzalcoatl. That's awesome that he's named after you! I wondered what it meant, and now it's clear! Yeah, the Horsemen are cool like that. They named a Red Mutant after Jess Horsely -- Ssejjhhorr from the Seventh Kingdom line.